There is new information on the outside of the ring. 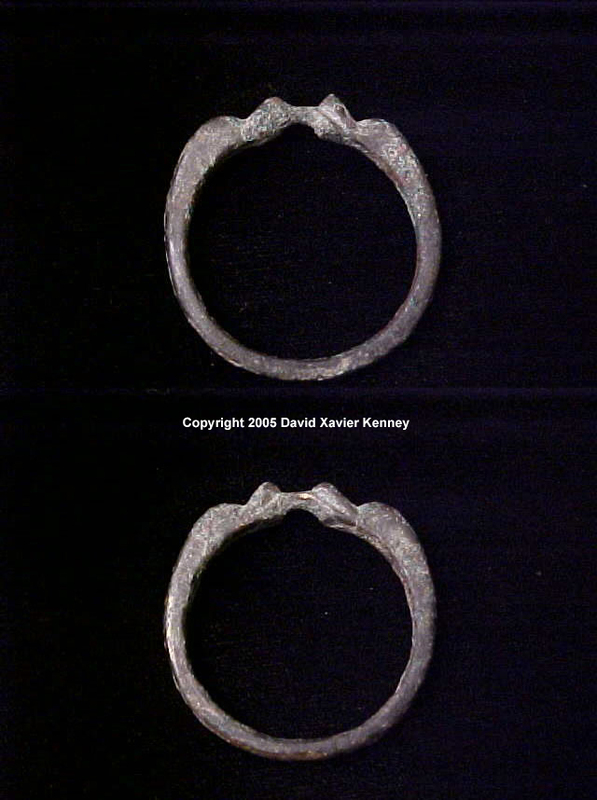 Around the entire ring there are light engravings of a wreath with various figures intertwined, it is extremely worn. It may have been lightly engraved as to have the wreath motif known only to the wearer, at any rate it will not appear when photographed. 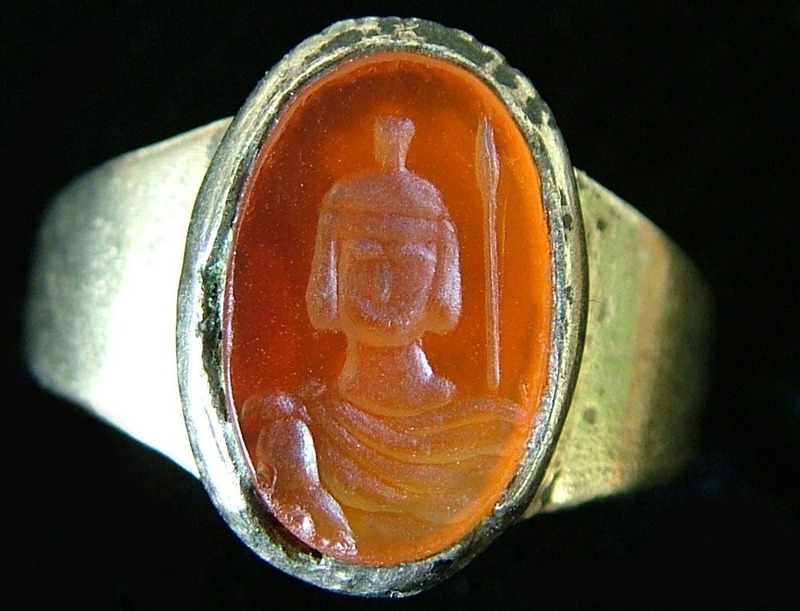 There is also new information with the inscriptions and art on the inside of the ring, as there has not yet been an attempt to photograph these, then there are currently no pictures with this information: It specifically shows that the original owner of this ring had been an Optio Centurionis (a second to a Centurion) when he received this gold band ring along with the Corona Civica (Civic Crown) during the dictatorship of Sulla. 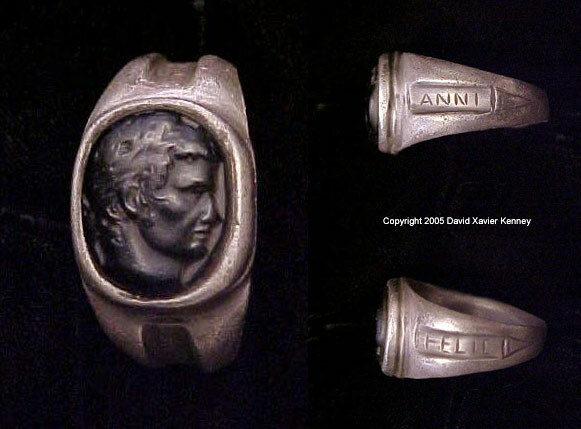 This hints that the gold band ring of the aristocrats may have replaced the iron band ring (if there ever was such a thing) of the same under Sulla. The images are precise, so it can be speculated that it was policy at least under Sulla that the gold band ring was awarded along with the coveted Corona Civica award. The Corona Civica was the highest Roman award for individual bravery, it was awarded to Romans only for saving the life of a fellow Roman in action, that is while taking and holding that specific ground until the completion of the battle. 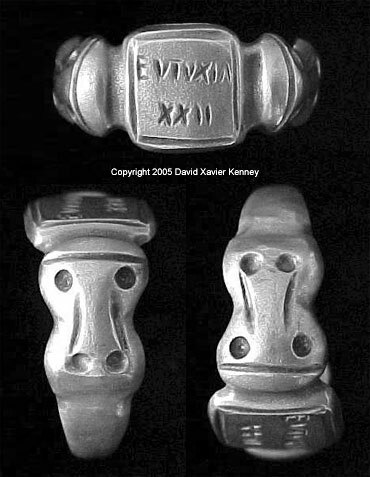 There is also an image of a bare headed legionary wearing torcs, armilla, and a large phalera. So it can assumed that the Optio had also received these awards at that time, or earlier on. The ring is an American size 9 3/4. There were two classes of Romans who wore "The Gold Band", those of the Senatorial class (the Nobles) and those of the Equestrian class (the Roman Knights or lesser Nobles). 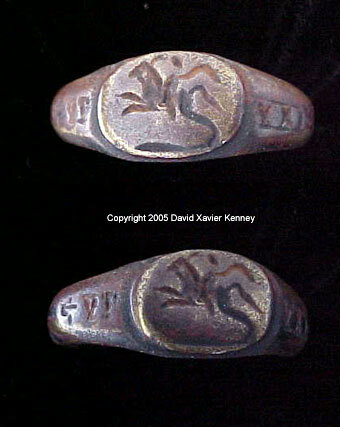 The following can be seen with the pictures provided: Picture 1 shows the ring itself. There are two areas on one side of the ring's edge that have engravings seen with the followig pictures. Picture 2 shows an animal's head, it may be a horse or a deer's head. There are figures behind this that may symbolize the hunting of that animal. Pictures 3 and 4 show small figures and the letters "M' and "R". Pictures 5 and 6 show a man's face in an Roman Attic helmet. On the helmet's crest there are several stacked figures, the bottom figure is in a balcony that is also the helmet's visor. Under the face there are the Roman letters "ARO", this should be a Roman reference to ploughing. Therefore the symbolism must be of Romulus and his ploughing of a square (in order to found Rome). The figures overhead may be either ancestors, semi-divine, or celestial figures. Picture 7 shows a boy in a conical hat, this should be a Penates or Lares. The following depictions and inscriptions are not seen with the pictures provided. 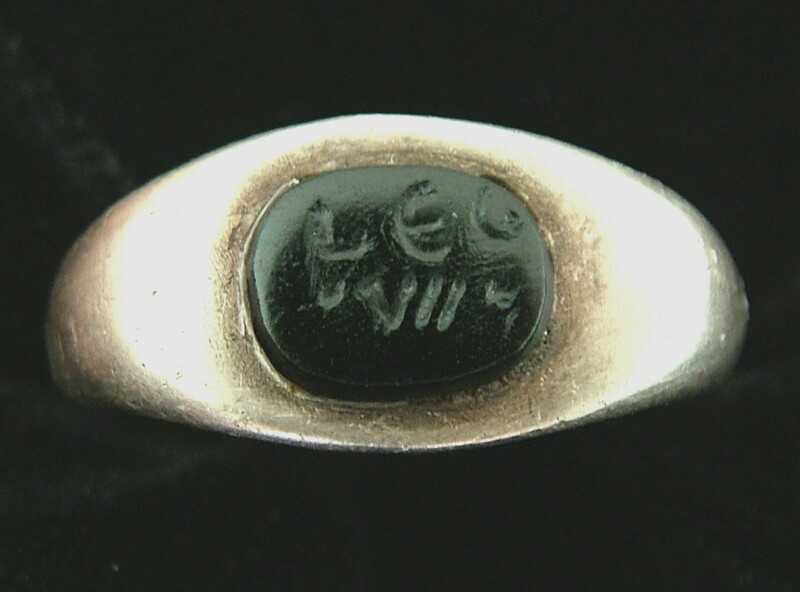 Although somewhat worn, it has miniature art on the inside, with this there are Roman letters and one large Etruscan or Oscan figure eight letter (thought to be for the Roman letter "F"). This figure eight letter is also made as a bear drinking from a cup, when slightly turned the bear will change into a wolf. In the bottom loop there s a boy's face. Next to this are Roman bind letters. 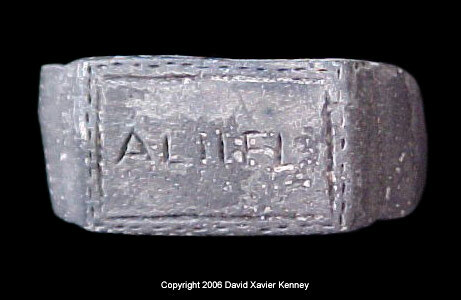 The letters appear to be an abbreviation for the "Aventine". When turned slightly the letters will change and appear as an abbreviation for the Palatine. When seen upside down, it is a boy holding a crested bird (wood pecker). When seen from one side, it is two semi-coiled serpents. Finely when seen from the other side, it is a serpentine man with an unknown serpentine animal. It is evident that the two boy figures are Romulus and Remus and that the two serpents are symbolic of the Aventine and Palatine hills. There are other depictions and inscriptions, one of the inscriptions is the "S C" (Senatus Consulto) of the Roman Senate. In legend the Roman Senate originated as a councilor group to Romulus. 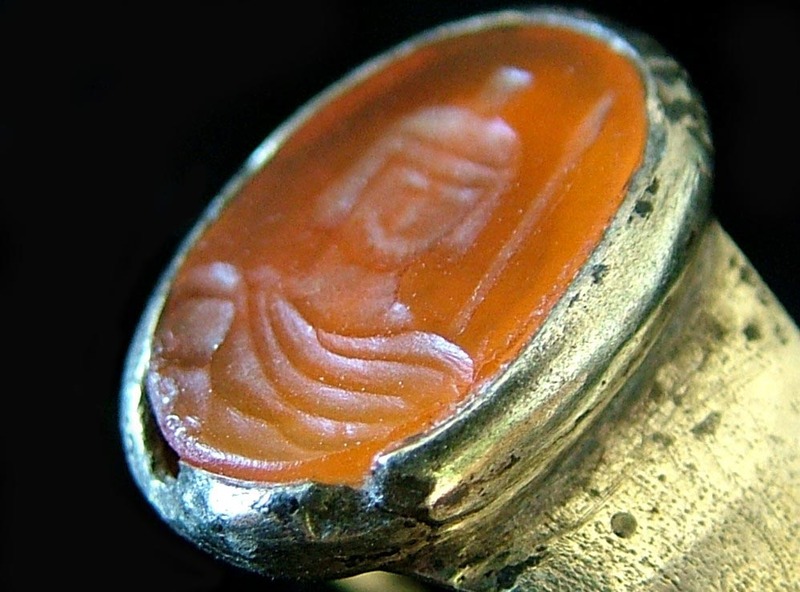 This is a silver alloy and carnelian Roman intaglio ring that belonged to a Praetorian Guardsman. 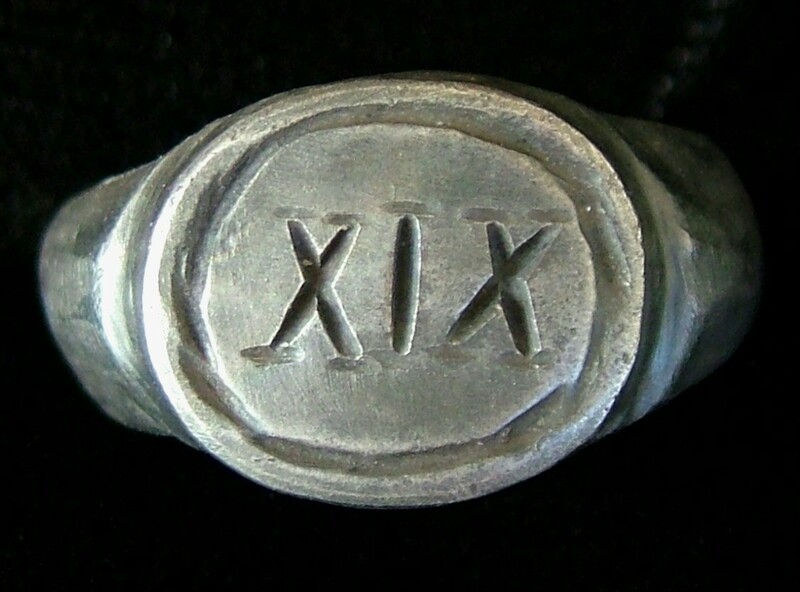 The ring is an American size 11. 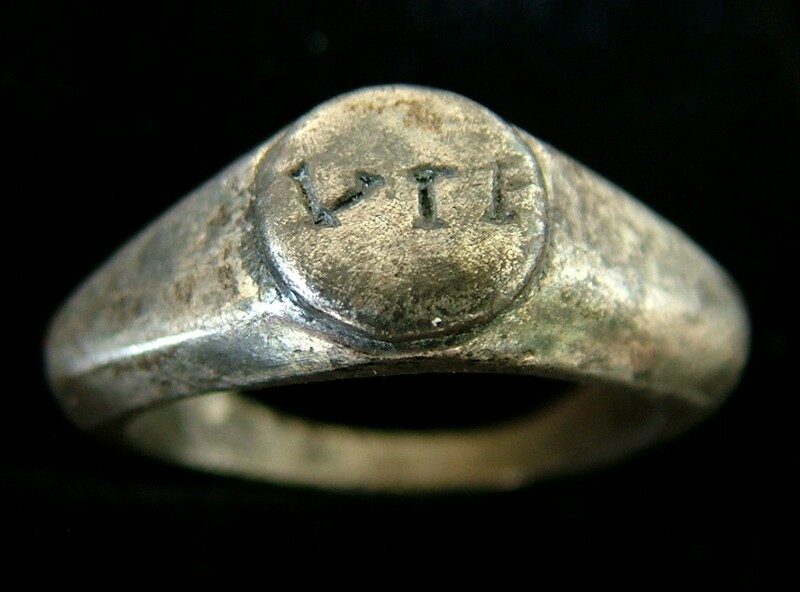 The ring appears to be initialed by the intaglio maker.. On the ring's band is art that commemorates the Siege / Battle of Jerusalem of the 1st Revolt; it is made in a scratch and dotted graffiti style. There are various inscriptions, two of these are abbreviations of the Praetorian Guard (P PR) and Legion XV Apollinaris (LEG XV AP). 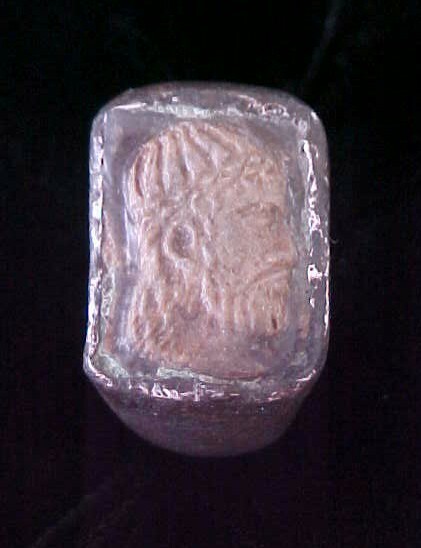 The art and technique on the intaglio is highly sophisticated. It was done with various levels of very refined miniature work and a gold wash. 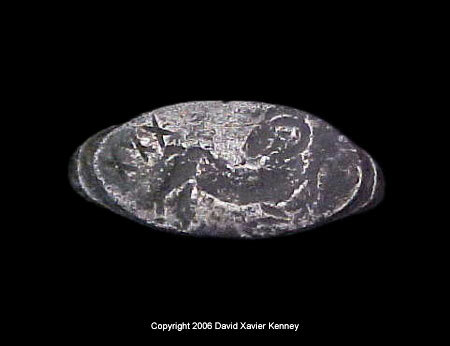 The primary work done on the bezel is of the Praetorian's unit II Cohors Praetoria. The bezel's outer portion is as a whip that is a scorpion's tail (thought there is much more with the miniature art on this). 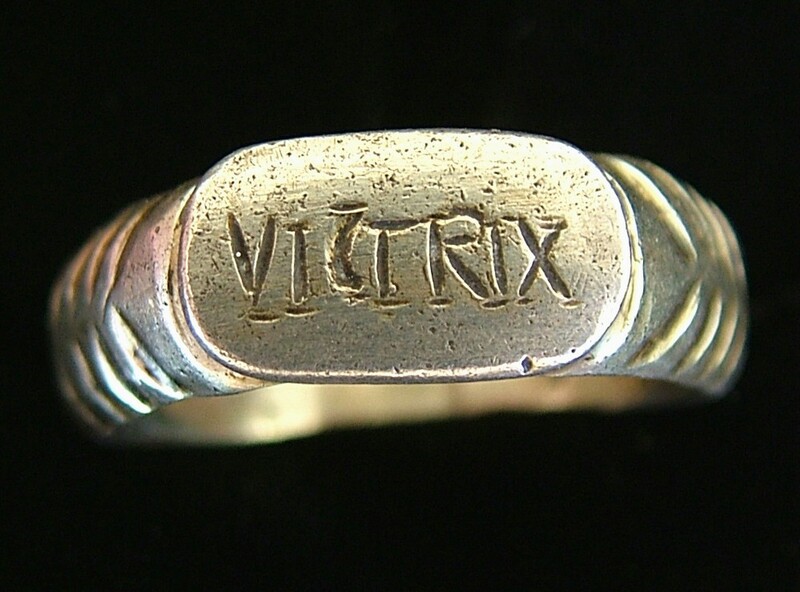 The scratch work on the bezel is of the Siege of Jerusalem during the 1st Revolt, apparently the Praetorian Guardsman that owned this ring was with Titus. 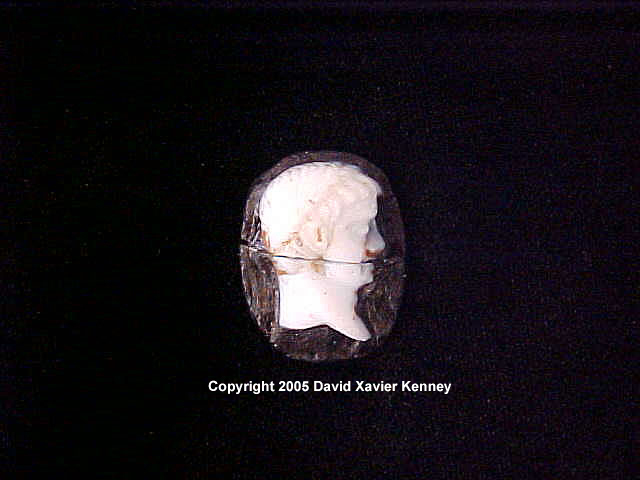 The other more miniature work on the bezel and the intaglio is of some type of mystery belief, it appears to be of the Sybil of Cumae, Augustus, and the his first Imperial Praetorians. It could be suggested that II Cohors Praetoria had a detachment at the Praetorian Naval Base at Misenum as besides the Sybil they appear to have had a connection to the sea. 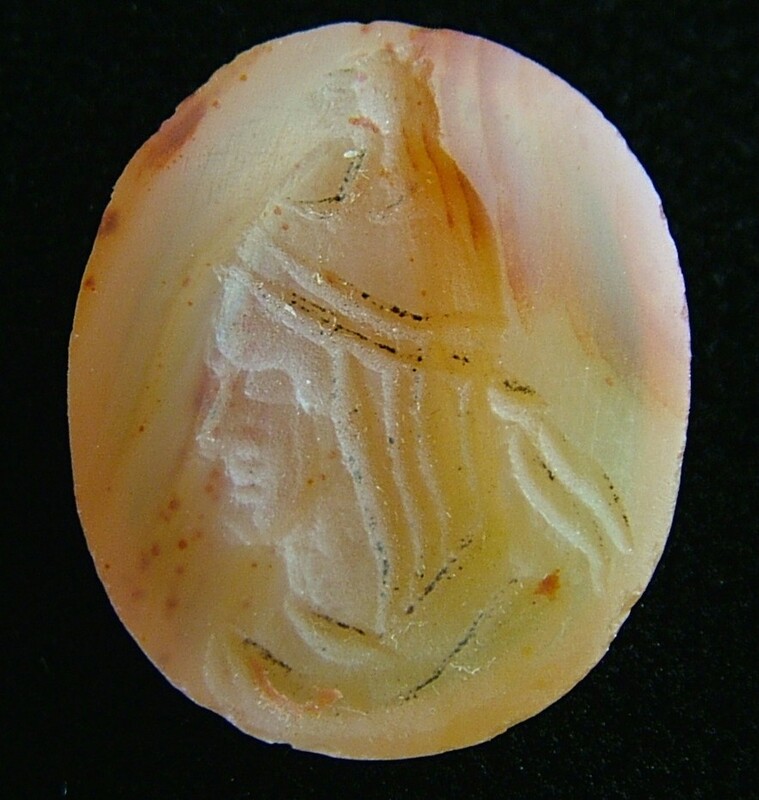 This group of pictures shows miniature art work in and on the carnelian (possibly done with a tint or reflection from the bottom of the stone) and on the bezel. The darker area near the Praetorian's helmet is the head of a lioness, it also hints of a bear's head. The break in the bezel in the front shows work that is reflected from the top of the bezel and the light coming through the stone. The break has a sword fish attacking another creature with smaller figures on it. There is a hint of a sea conflict. A section of the carnelian hints of volcanic larva. This group of pictures shows miniature art work on the bezel's breaks on the front and on the side. The side's break show more of the same sea conflict or another sea conflict. 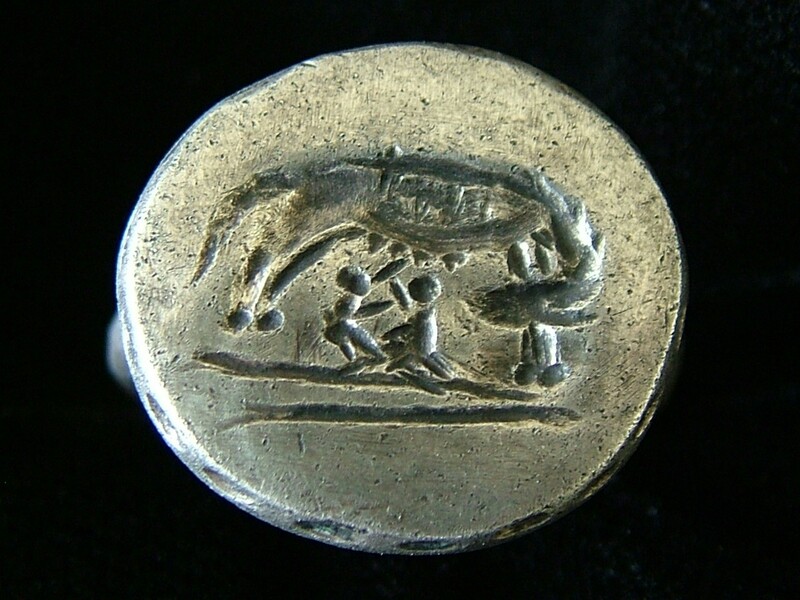 Summery of what is seen on the bezel and the miniature art on the intaglio: Although this mystery is not completely understood it appears that it is associated with three goddesses; Diana (bear), Venus Victrix (swordfish), and Cybele (lioness) through the Sybil of Cumae. With gods it appears to be associated with Apollo (but also Sol Indiges) and Hercules. This also has to do with a volcano (Vesuvius) or volcanoes (Vesuvius and Aetna), the straights of Messina (swordfish). There is some kind of a northern connection with all this. There are a few suggestions that they may connected this to stories of the volcano on the island of Thule (Hekla of Iceland). My research shows that the Romans and perhaps others believed that all volcanoes were connected by underground rivers of lava. On the band flanking the bezel there are stylized elephant heads which are engraved in a Celtic style. This design may be due to recruits coming from Gaul and this legion's long service in Egypt. 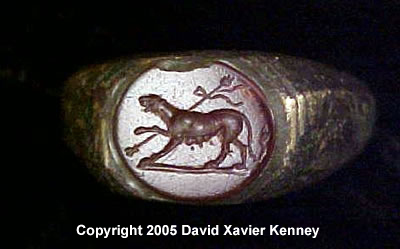 The ring's bezel shows an elephant and an uncovered legionary in the elephant's front quarters, this may be a representation of this legion's Aquilifier (Eagle bearer). Overhead are two stars (Dioscouri) and a bird. The bird should be an eagle but it appears to be more similar to a lark. The bezel is flanked on the band by engravings of elephant tusks. The V Alaudae had been the only Roman legion to have the elephant as it's official emblem, this distinction had been earned by successfully engaging a war elephant charge in their first action. The V Alaudae was also the first legion to have been recruited from foreigners (Gauls) outside of Italy (Raised and financed by Julius Caesar). In essence the V Alaudae was the world's first foreign legion, the fact that these legionaries were from ancient Gaul (Modern France) is a rather interesting coincidence. 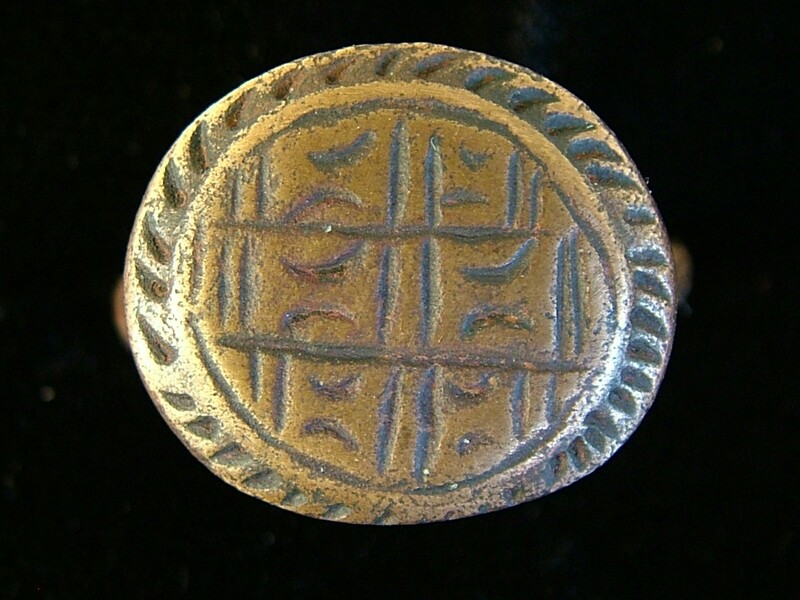 This bronze ring has; traces of silver alloy gilding, faint traces of gold gilding, faint traces of a type of lead/resin paste, and lead wash. 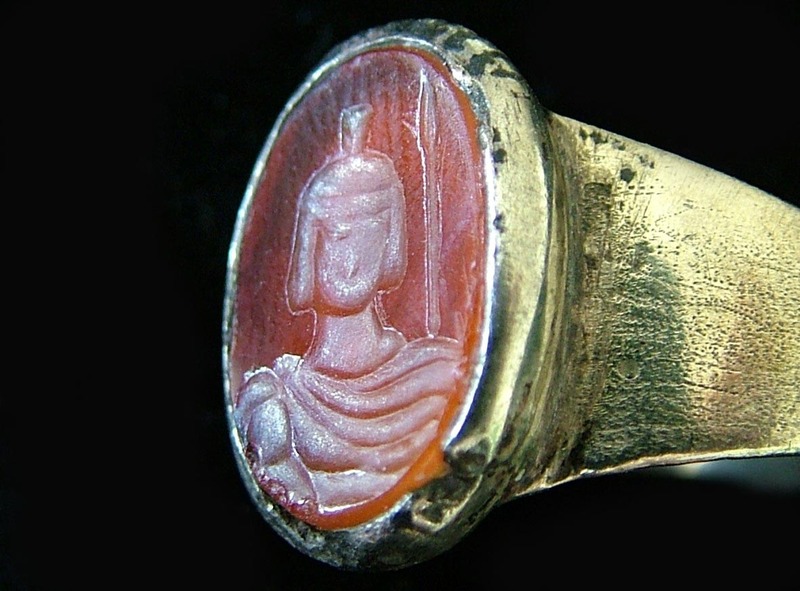 Although it is not a particularly refined ring in it's original condition it was a highly elaborate. 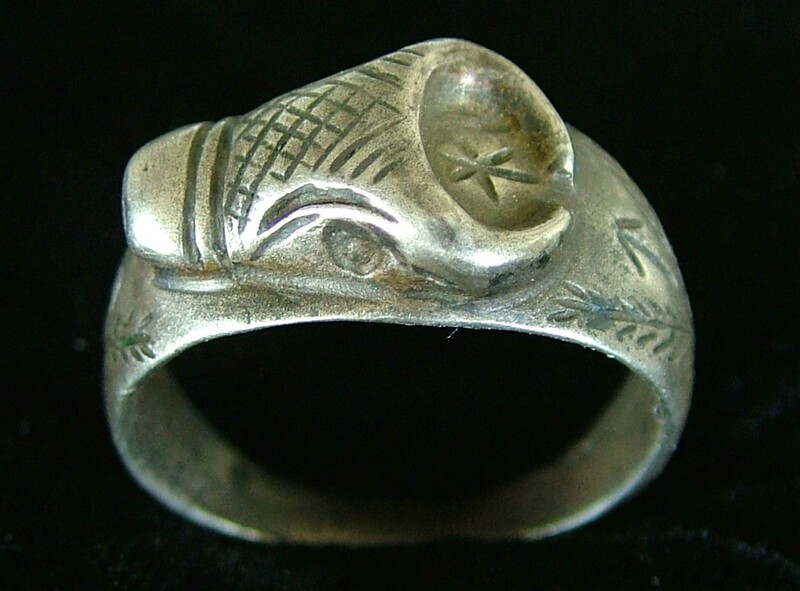 First, I should mention that I have no doubt that this ring originated from some region of Germany or the Balkans, it is definitely not from the British Isles. There is an inscription and symbols for Britannia (that are not discussed here. 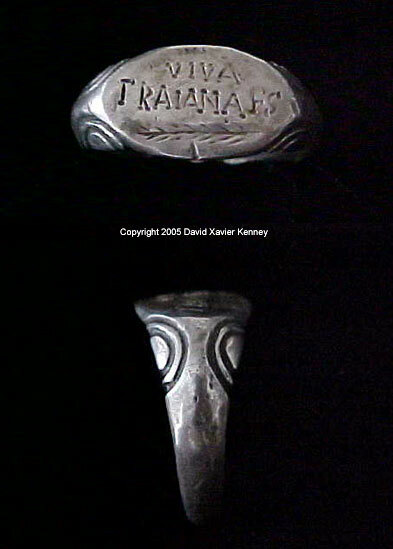 There is a light inscription between the "I" and the "X" that shows bind letters for "HISPANIA", several of these can also be seen as "HAD" for HADRIAN, there is also a large figure taking a wreath from a small figure (a victory). There are suggestions with art on the "X" that this was for a victory over a Germanic tribe. The circle above the eagle's head is a solar disc that is also a round shield, there are figures inside the shield's boss and the letters "I" and bind letters "CS", this should stand for Julius Caesar as the founder of the IX Hispania. On the front of the eagle's head and on the eye there are the bind letters "I", "H", "P", "A", "T", and "M". This should stand for Emperor Hadrian Publius Aelius Traianus Hadrianus Pontifex Maximus. All this suggests that Legion IX Hispania had either been sent to the Balkans or had detachments in the Balkans under Hadrian, that it most likely was not as the revisionists now speculate destroyed in Britannia. Due to the additional effort with the artesian making an inscription with bind letters of Hadrian's full name and title on the eagle's head, then I think that this may suggest that the IX Hispania had in fact lost their Aquila (Eagle) at some point under Hadrian either in Britannia or Germania, and that it had been replaced, perhaps due to circumstances. At some point in the future I expect to have pictures posted of at least some of these inscriptions. The eagle is flanked by two saluting signifier standards. One of the eagle's wing's has a heart shaped ribbon or laurel. 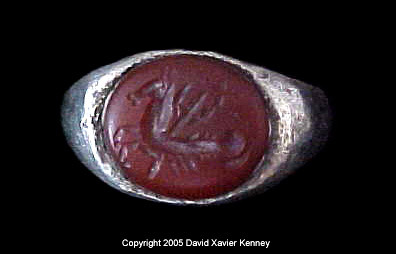 This suggests that the XI Claudia may have had an entire Cavalry Ala (Wing of 500 Cavalrymen) permanently attached to it, that is at the time the ring was made. In April of 2012 I was contacted by a gentleman for a request for more info. 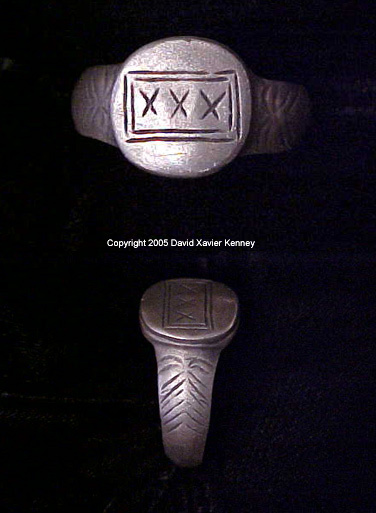 about this ring, as well as compliments on the research. The gentleman claimed to be of a family that was of a Davidic and Solomonic secret society as custodians (guardians of that bloodline) descended from the original members of the Sicarii of the 1st C. AD. He wrote that he had been raised, schooled, and initiated in that society; but then due to the changing times it was now only an honorific family tradition. He sent me some info. 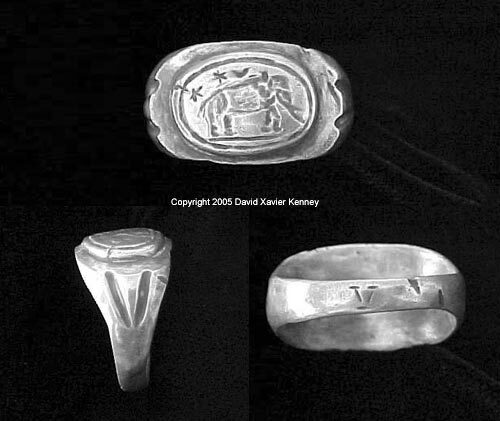 that included images of three wax seal impressions belonging to his family, all three were very interesting, but one stood out, it is from an ornate late 19th C.seal with the name of that secret society and Canterbury, England. Canterbury is where he said the secret society had been headquartered at one time. The gentlemen claims that the most prominent symbology (Lion of Judah, three levels, ect.) 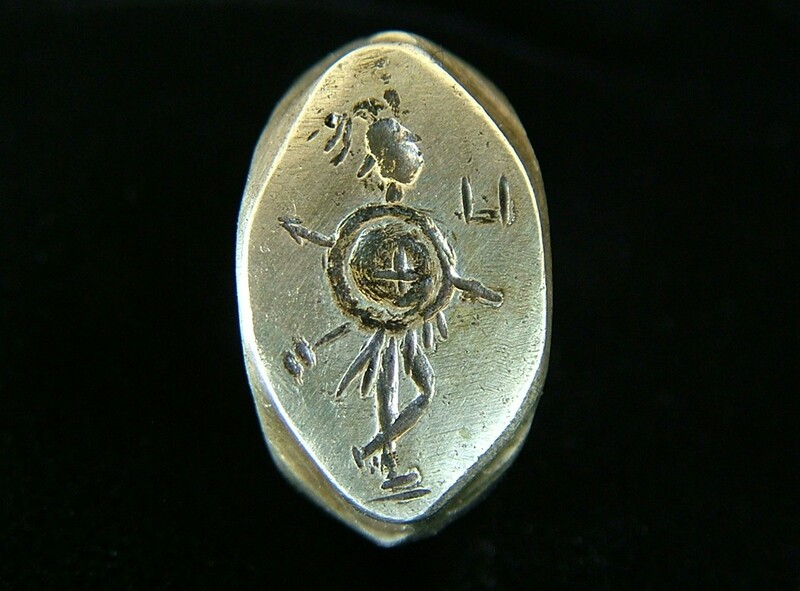 on this ring is the same of some of his family's esoteric teachings, and that it most probably belonged to an ancient Sicari who had been of the same tradition. As I knew that the details on the inside of the ring's bezel are exceptional, I decided to do an even more detailed inspection. 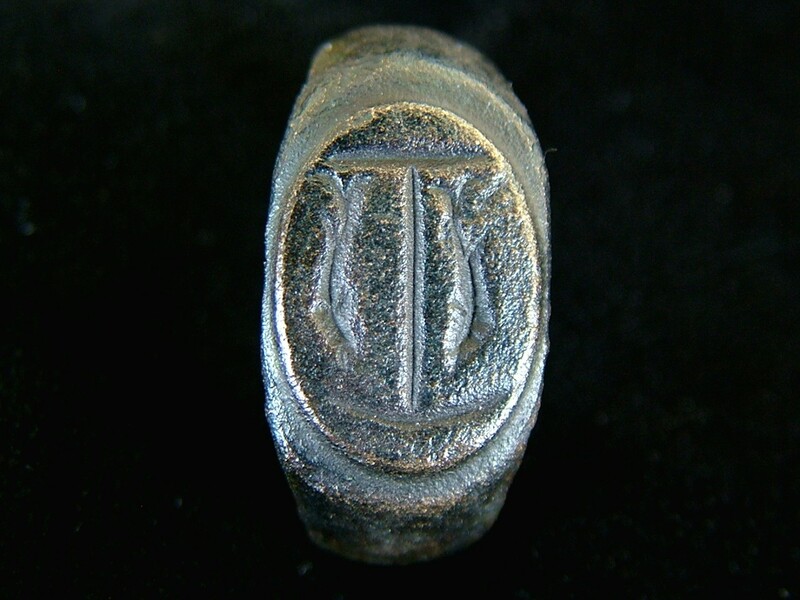 After that examination I came to the conclusion that there are several suggestions that the bronze used for the ring had been from melted down bronze objects - At least one being Judaic (possibly two) and the other from a Sicarii Roman trophy of the First Jewish Rebellion, perhaps! 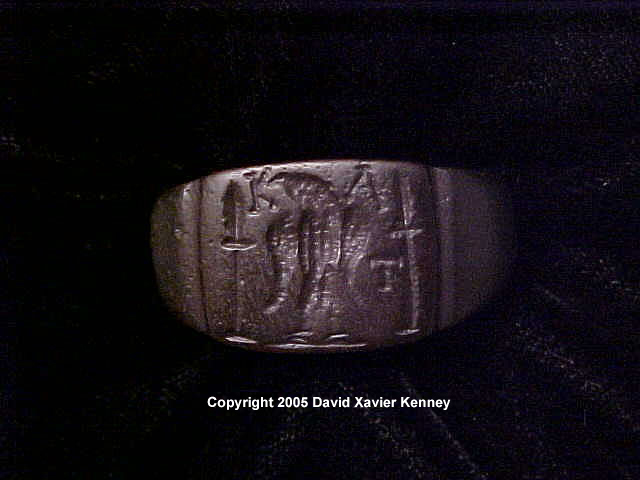 When I can get to it, I will post more images of some of the ring's details on the inside, as well as additional info.